It's actually been a while since I've baked at home and certainly a while since I've baked something that looks this impressive. Of course, forgive me for blowing my own trumpet, but I was pretty darn proud of this cake. 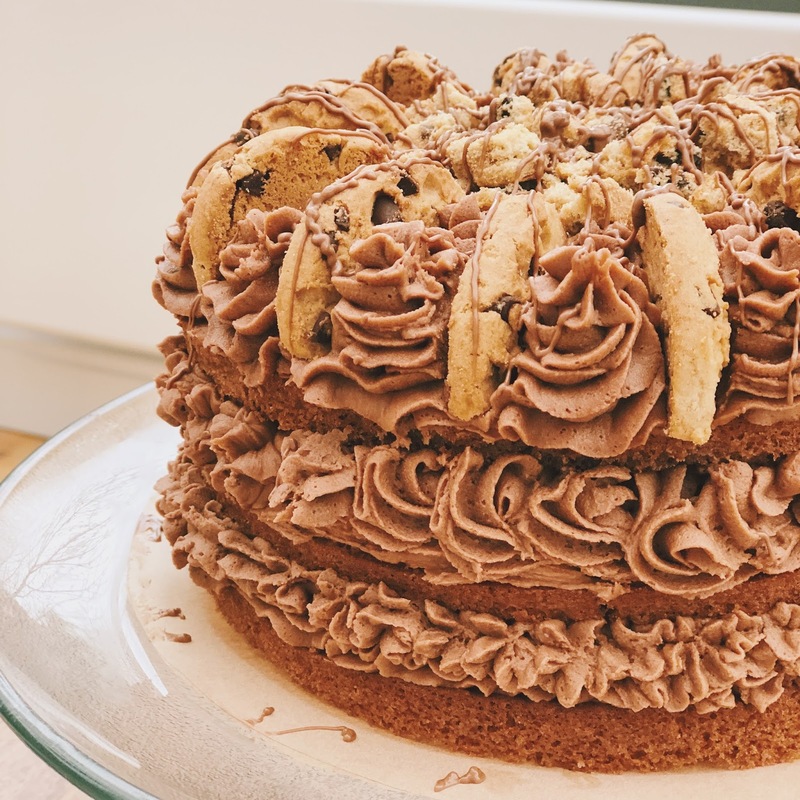 It was baked in celebration of my sister's birthday; I wanted to do something homely and something that resonates our family and that, of course, had to mean that biscuits were involved. 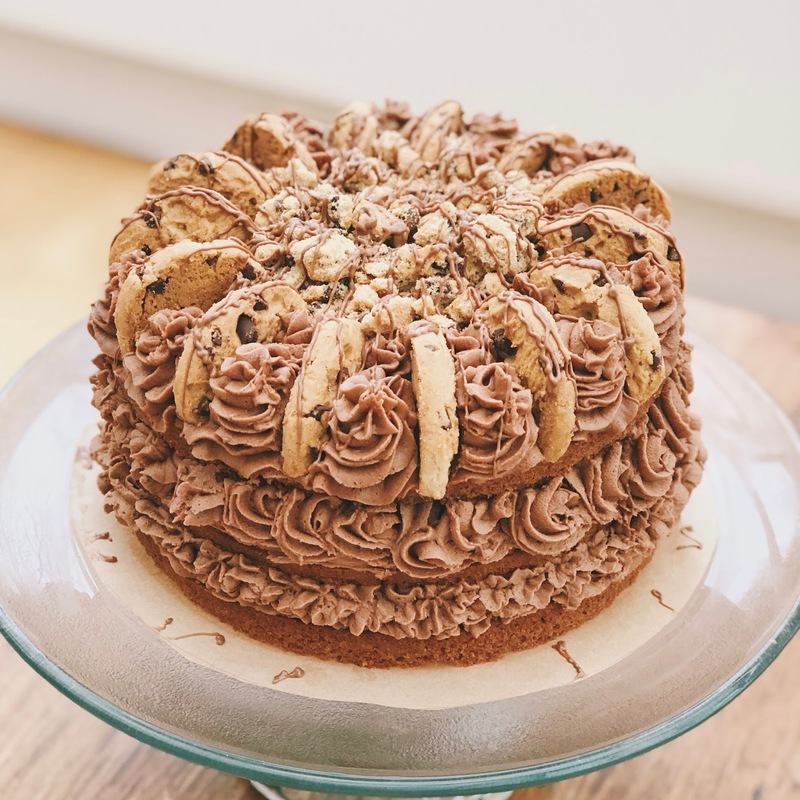 The idea of using Chocolate Chip cookies came from the wonderful cake bakers at The Tea House and my measurements were based on this BBC Good Food recipe. I baked these cakes the day before I was due to decorate and assemble the pieces together but made sure that, before storing them, they were completely cooled down, and in a very airtight container with a layer of parchment paper between each layer. Taking care of them with this precision ensured that the quality of the cake didn't waver and, when the cake was served, there were no signs that the cake had been pre-prepared. I started the bake by heating my oven to 170C Fan, aligning my wire rack in the middle of the oven, then lining the bottom of my tins with greaseproof paper. I use loose-bottom tins, so I find it is really simple to slide the paper into the bottom - I'd definitely recommend this method. After that, I took a lump of unsalted butter around the width edges of the tin to make it easier to remove the cake at the end. Again, taking this much precaution really does pay off in the end. The BBC recipe suggests that you add all of the ingredients into one bowl and mix but for me, as someone who has been taught the old way by my Grandma, I couldn't bare do it that way. I started by creaming together the butter and sugar - it's easiest to do this with an electric whisk because otherwise, it can take an awful lot of wrist work. It's important to mix these ingredients together until completely soft to avoid lumps of butter and thus a bubbly cake. After that, the eggs were added in 2 at a time and whisked into the mixture with the vanilla extract. Before I added the next ingredients, I added them all together in one bowl so I had flour, cocoa powder and baking powder all together. I sift these in then, using a large spoon, folded it all together. As my mixture looked a little thick, I added the milk in next. And, for the cakes, it's as pretty simple as that. Separate them into 3 tins (or, if you only have one tin, third your mixture and bake on at a time), bake them for approx. 20 minutes each, then allow them all to cool to cold on a cooling rack. First of all, I melted the chocolate in the microwave until melted through, but kept stirring every 20 seconds. The chocolate should be able to be lifted from a spoon 20cm from a bowl and have a consistent run. Leave it to cool for 5 minutes but do not let it set. You'll save yourself a lot of time here if you make sure that your butter is softened, but also make sure you don't melt it into an oil. I creamed together the butter and the sugar, the same way as I did the cake, until the mixture was more white than yellow. I then added the milk and the Cocoa powder gradually. Make sure that any powder added to this mixture goes through a sift - it makes things a lot easier to work with. Finally, I stirred in the chocolate and made sure it went right through the mixture. Once you have a thick, peanut-butter type consistency, start putting your mixture into a piping bag. This part is optional - by all means, a cake doesn't look any worse if the icing has been slapped on with a knife, using a piping method is just how I decided to do it on the day. I chose to go for 'random' with the decoration on this cake, but it turned out looking pretty uniform. Obviously, add the buttercream on the top of each layer and sandwich them together. Then, finally, to top it all off, I positioned halved cookies around the perimeter of the cake and filled in the middle with a handful of crushed biscuits. Again, it's optional to drizzle over an leftover chocolate but I thought, why not!? And that's it, really! It honestly is easy to make an impressive cake. I seriously recommend doing the 'bake one day, decorate the next' method if you're cooking for a guest because it makes the whole process so much easier and more relaxing. Of course, you can add whichever toppings you like! Which toppings would you add?